Here's a great promotional product to let your customers, friends and patients know you appreciate them. Gift Tags keep your name in the forefront during the busiest of all seasons. Sticker sheets fit nicely into a standard #10 envelope. Gift Tag sticker sheets are great for shopping malls, holiday events, pediatricians, dentists, toy stores, clothing stores and more! Each sheet of gift tags allows for your custom copy to be printed in black ink. Imprint area is 1/2" x 2-3/4". An optional back black imprint can be added (for an additional cost) to any sticker sheet. Most sticker sheets measure 3-1/4" x 7". 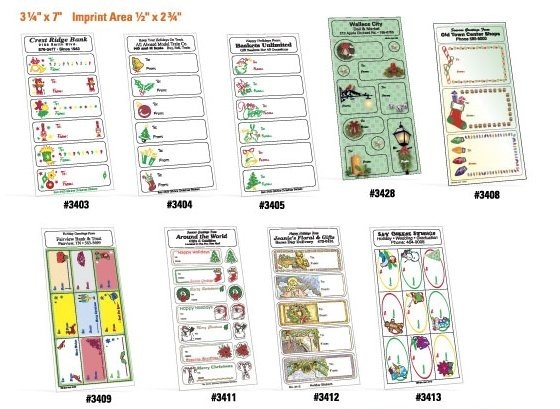 Item #3414 and #3415 sticker sheets measure 3-1/2" x 8-1/2". An additional $15 non-refundable artwork charge must be paid before work can begin. 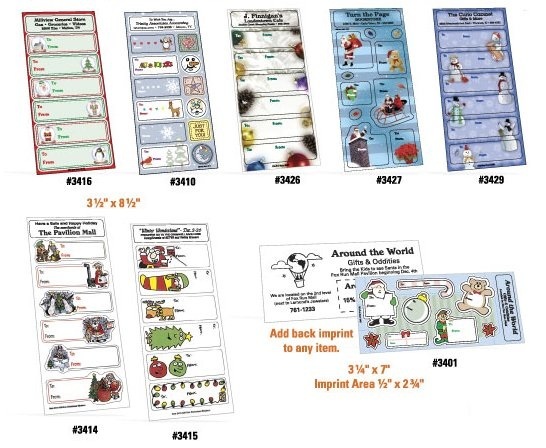 An assortment of sticker sheets with the same ad copy is available in multiples of 250 sheets at no additional charge. Gift tags are printed on white gloss paper (permanent adhesive). Colored stickers are standard and as shown. Personalized copy printed in black only. 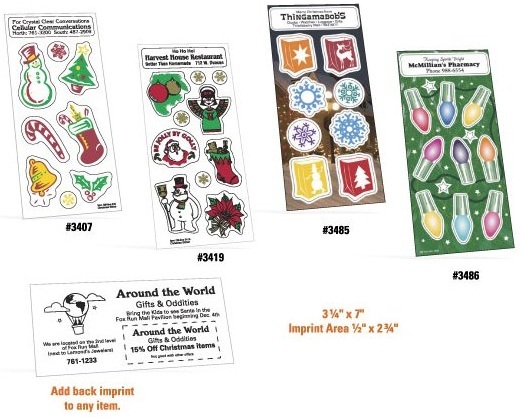 Spruce up your Christmas and holiday mail, gifts and packages with these decorative stickers! 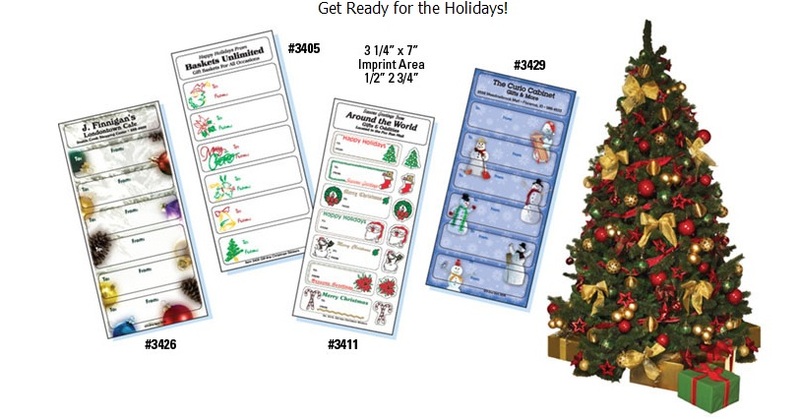 Christmas and Holiday Sticker Sheets measure 3-1/4" x 7". Each sticker sheet allows for your custom copy to be printed in black ink. Imprint area is 1/2" x 2-3/4". An optional back black imprint can be added (for an additional cost) to any sticker sheet. 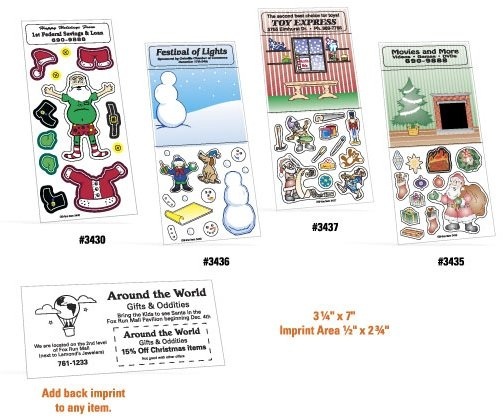 Christmas and holiday stickers are printed on white gloss paper (permanent adhesive). Colored stickers are standard and as shown. Personalized copy printed in black only. Create different scenes with these repositionable stickers for hours of endless fun! Sticker sheets are 3-1/4" x 7" with a 1/2" x 2-3/4" personalized imprint area on the front available in black only. Optional back black imprint can be added (for an additional cost) to any sticker sheet. Peel 'n Play Sticker Sheets are printed on white gloss paper with repositionable adhesive.